I was going through our file attachments on Barthmobile and decided I would put them all in one place for ease of finding them. If something looks like it is duplicated, mislabeled or needs to be amended, let me know so I can straighten this out. 1.) Spartan Schematic - 1993 38ft Regency - 510 KB ~ Original post located here. 2.) Spartan Schematic - 1993 32ft Regency - 105 KB ~ Original post located here. 3.) Spartan Chassis Manual EC 2000/WC 2000 - 27,328 KB ~ Original post located here. 4.) Spartan VIN Identifier Chart 1995 - 1999 - 266 KB ~ Original post located here. 5.) Sharp Microwave Manual R-1830/R-1831 - 1,092 KB ~ Original post located here. 6.) Jetco Air Ride Suspension - 372 KB ~ Original post located here. 7.) Kohler Genset Service Manual - 8,958 KB ~ Original post located here. 8.) P32 - P30 GMC Fuse Panel - Late 90's - 67 KB ~ Original post located here. 9a.) Onan DKD Service Manual - 2,208 KB ~ Original post located here. 10.) DKD Kubota Engine Manual - 7,470 KB ~ Original post located here. 11.) How To Choose A Generator - 92 KB ~ Original post located here. 12.) Motor Home Buyers Guide - 38 KB ~ Original post located here. 13.) How To Sell Your Barth - 494 KB ~ Original post located here. 14.) GM P32 - P30 Publications - 2,048 KB ~ Original post located here. 16.) 35' Regency Coaches From 1982-1985 - 2,315 KB ~ Original post located here. 17.) 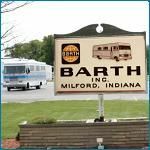 Barth Success Story From 1988 - 128 KB ~ Original post located here. 18.) Barth Iveco Literature - 1,345 KB ~ Original post located here. 19.) Barth, Looking Back - 125 KB ~ Original post located here. 20.) 1988 Barth Regal Brochure - 5,981 KB ~ Original post located here. 21.) 1992 Barth Breakaway Brochure - 1 - 1,710 KB ~ Original post located here. 22.) 1992 Barth Breakaway Brochure - 2 - 821 KB ~ Original post located here. 23.) 1979 Barth Brochure - Entire Product Line - 3,765 KB ~ Original post located here. 24.) 1973 Barth Catalogue - 8,260 KB ~ Original post located here. 25.) Air Lift 1000 KIT No. 81560 - 546 KB ~ Original post located here. 26.) LED Tail Light Conversion - 1,876 KB ~ Original post located here. 27.) Generator Silencing Article - 836 KB ~ Original post located here. 28.) 6V - 12V Battery Comparison - 44 KB ~ Original post located here. 29.) Barth Roof Coating - Anvil 400 - 35 KB ~ Original post located here. 30.) Neway Tandem Air, 3rd Axle Air Suspension System: TA3-CA-865 - 1,927 KB ~ Original post located here. 31.) 1993 Barth 38' Regency Wiring Pt1 - 26 KB ~ Original post located here. 32.) 1993 Barth 38' Regency Wiring Pt2 - 12 KB ~ Original post located here. 33.) Day & Night Shade - restringing diagram - 369 KB ~ Original post located here. 34.) Barth Patent #3,282,603 "Vehicular frame and method of construction" - 382 KB ~ Original post located here. 35.) Barth_MCC_Article.pdf - 3,845 KB ~ Original post located here. 36.) Barth Buyer's Checklist - 9 KB ~ Original post located here. 37.) AH4 Type 36 & Type 50 Rotochamber Brake Chamber - 7,900 KB ~ Original post located here. 38.) GMC AC Mounts 1986 Option 7N4.PDF - 56 KB ~ Original post located here. 39a.) Chevy P32 Vaporlock Issues - 742 KB ~ Original post located here. 39b.) Chevy P32 Vaporlock Issues - vapor_lock_App7-7.pdf - 2,280 KB ~ Original post located here. 40.) 1996 Monarch Spec Sheet. - 653 KB ~ Original post located here. 41.) 1986 P30 Wiring Diagram - 1,692 KB ~ Original post located here. 42a.) 1986, P-30 Service Manual - Part 1 PDF - (6,272 KB) ~ P30 manual part1 ~ Original post located here. 42b.) 1986, P-30 Service Manual - Part 2 PDF - (7,273 KB) ~ P30 manual part2 ~ Original post located here. 42c.) 1986, P-30 Service Manual - Part 3 PDF - (5,300 KB) ~ P30 manual part3 ~ Original post located here. 43a.) 1993 Regency DC sys part 1 - (80 KB) ~ 93 Regency DC sys part 1 ~ Original post located here. 43b.) 1993 Regency DC sys part 2 - (219 KB) ~ 93 Regency DC sys part 2 ~ Original post located here. 43c.) 1993, Excel spreadsheet 1 & 2 - Part 3 - (104 KB) ~ 1993, Excel spreadsheet 1 & 2 - Part 3 ~ Original post located here. 44.) Allison Transmission MD3060 & Shifter Info - Original post located here. Thank you so much for making this simple for us. Thanks Bill. This helps us rookies more than you will ever know. Thank you for such a clean Library of documents! thnak you, thank you thank you. My bad....I just saw that Bill had posted this...opps!